Explanation: Comets become fountains of gas and dust as they get near the Sun. Solar heat vaporizes the outer layers of these spectacular orbiting icebergs, exposing caverns of pressurized gas that erupt into jets. 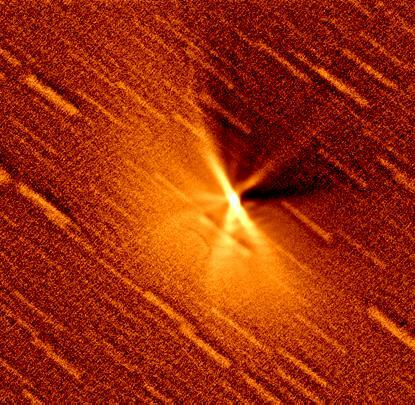 The above digitally enhanced image of Comet Hale-Bopp was taken on January 29th and highlights several of these dust jets. Here, background stars appear as faint raised streaks. Comet Hale-Bopp is currently brighter than most stars, and is visible in the morning sky. Comet Hale-Bopp will continue to brighten and develop an extended tail until April.